"As for who to believe and who you can't believe... can you believe at all - you can't believe anyone." At one point during the interview, Wallace tried to hand Putin a copy of the DOJ indictment of 12 Russian military intelligence officers, but instead of taking it, Putin asked that he place it on a side table. Pushing back against claims that the Russians have compromising information on Trump, Putin said "I don't want to insult President Trump when I say this - and I may come as rude - but before he announced that he will run for presidency, he was of no interest for us." He then went on to claim that it would be impossible for Russia to have influenced the 2016 election. "Interference with the domestic affairs of the United States - do you really believe that someone acting from the Russian territory could have influenced the United States and influenced the choice of millions of Americans?" Putin said. "This is utterly ridiculous." Russia doesn't even have the resources to track Trump even if it wanted to, Putin said. For example, the annual St. Petersburg Economic Forum usually attracts 500 business leaders and most of them are industrial tycoons on a "greater scale" than Trump, yet do the Americans think Russia organized surveillance on all of them? "Do you think that our Special Services actually organized surveillance on each and every of them?" Putin said. "Well, unlike you, unlike the United States, we don't do this. We don't have enough resources. We don't have enough manpower to organize the total state of control. That's not part of our plans. And it's clear that we did nothing of that kind of against Mr. Trump." Asked how Russia might respond if either Georgia or Ukraine were to join NATO, Putin scoffed, saying his reaction would be "negative." 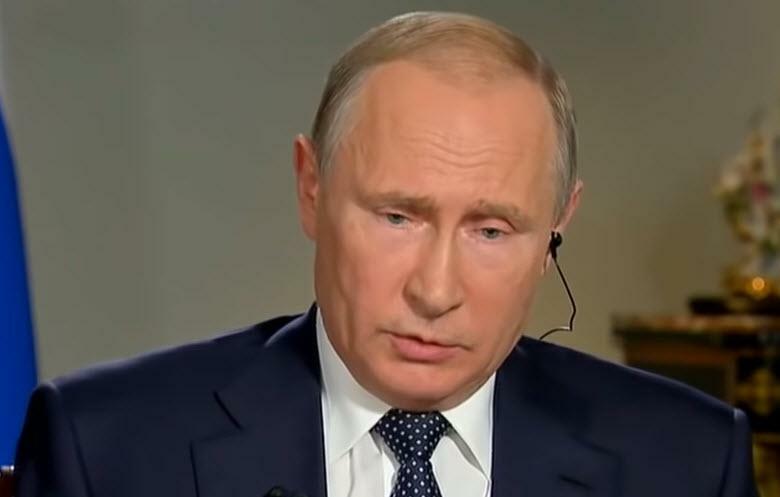 "For us, well, it's a direct and immediate threat for our national security…moving this NATO infrastructure towards our borders would be a threat, and…the reaction would be extremely negative," Putin said. Moving on to Syria, Wallace asked about reports made by independent monitors claiming that Russia has bombed civilians in Aleppo and Ghouta, to which Putin replied that "victims are inevitable." "You know, when there [is] warfare going on - and this is the worst thing that can happen [for] humankind - [victims] are inevitable, and there will always be a question of who’s to blame. I think it is the terrorist groups who are to blame who destabilized the situation in the country." But when Wallace asked if Putin had qualms about killing innocent men, women and children, the Russian president chided him, accusing him of being "completely deceived." "You are completely deceived, and I am very sorry that you do not know the real situation…about Syria." Toward the end of the interview, Wallace pointed out that many of Putin's political opponents have ended up dead or close to it. Putin pointed out that political killings happen in the US as well. "Well, first of all, all of us have plenty of political rivals. I'm pretty sure President Trump has plenty of political rivals." Wallace replied: "But they don't end up dead." "Haven't presidents been killed in the United States?" Putin replied. "Have you forgotten about - well, has [President John F.] Kennedy been killed in Russia or in the United States? Or [Dr. Martin Luther] King? What - and what happens to the clashes between police and, well, civil society, and some - several ethnic groups? Well, that's something that happens on the US soil. All of us have our own set of domestic problems."